A new study indicates that rates of infection following colonoscopies and upper-GI endoscopies performed at ambulatory surgery centers (ASCs) is much higher than previously expected, according to a news release. The researchers analyzed 2014 data from an all-payer claims database, specifically focusing on six states: California, Florida, Georgia, Nebraska, New York and Vermont. They examined infection-related emergency room visits and unplanned inpatient admissions within seven and 30 days after a colonoscopy or upper-GI endoscopy, knows as esophagogastroduodenoscopy (EGD), was provided at an ASC. What they found was greater-than-expected risk of bacterial infections, including E. coli and Klebsiella, according to the release. The lead researcher stated that while post-endoscopic infection rates were previously believed to be about one in a million, the new research indicated that the rate of infection seven or fewer days after the procedure was slightly higher than 1 in 1,000 for screening colonoscopies and about 1.6 per 1,000 for non-screening colonoscopies. For EGDs, rates of infection within that timeframe were more than 3 per 1,000. At an even greater risk of infection: patients hospitalized before undergoing one of the procedures. The researchers found that almost 45 in 1,000 patients hospitalized within 30 days prior to a screening colonoscopy went to a hospital with an infection within a month. Using those same time parameters, the rate of infection-related hospitalization for EGDs was more than 59 patients per 1,000. Among ASC post-procedure infections, rates were slightly higher for diagnostic versus screening procedures. ASCs with the highest volume of procedures had the lowest rates of post-endoscopic infections. Infection rates at some ASCs were more than 100 times higher than expected. 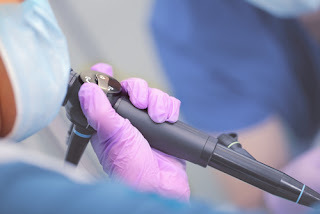 The study, titled "Rates of infection after colonoscopy and osophagogastroduodenoscopy in ambulatory surgery centres in the USA," was led by a Johns Hopkins researcher, with its results published in the British Society of Gastroenterology's journal Gut. Does your surgery center need assistance with infection prevention and control? Learn about ICCS's services for ASC infection prevention.